Last year Russian Academy of Sciences and Roscosmos proposed to include the Lander for investigation of the Jupiter Moon Europa as an additional element of EJSM/Laplace international mission to Jupiter system. The main scientific objectives of this element will be a search of possible present and past signatures of life and ‘in situ’ studies of the environment by remote and contact methods. Scientific tasks: current knowledge of Europa environment (interior, surface and atmosphere). Results from Pioneers, Voyagers, Galileo, and ground-based telescopes. 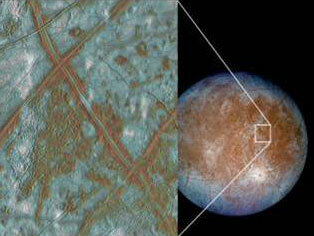 Astrobiology vision of Europa . Synergy between Lander and EJSM/LAPLACE mission spacecraft (including possible joint experiments). Orbital constraints, radio relaying options. Scientific payload for Europa lander: scientific goals, scientific requirements, mass and energy budgets, possible implementations, technical aspects. Priorities for selection of the landing site. Lander technical design including radiation protection. If you are interested to participate in this EUROPA LANDER WORKSHOP, please fill out the short pre-registration form at our website. Second announcement (including workshop details, call for abstracts, registration, and other important information) will follow in October. Do not hesitate to forward this e-mail to anyone potentially interested. The deadline for this pre-registration is September, 25, 2008.